If you require storage, either short term or long term, Greens Removals can help. 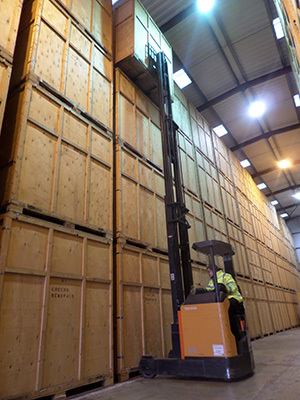 Our removals storage warehouse, custom built in 1999, is one of the most modern storage facilities in East Anglia and one of the only facilities in the region to be certified as BSEN 12522. There are many reasons why you might need to store furniture and effects: between moving houses, during a temporary job posting, while renovations or repairs are carried out, or simply down to a lack of space in your home. Whatever the reason, if you need to store some of your household goods for a few days, weeks, or indefinitely, you can rely on Greens Removals to help you out. Containerised furniture and personal effects storage containerisation is the modern form of storage for household goods. It is clean, secure and ideal for long-term situations, as all goods are loaded into containers either at your residence or at store and everything remains sealed from that moment until the day it is returned. Greens Removals maintain a substantial storage space for items unsuited for containers or requiring special maintenance whilst in storage. This method is more flexible. Every item is wrapped and dust-protected. You can inspect your goods by arrangement and single items can be added or taken out of storage. Temperature and Humidity controlled areas are provided to protect sensitive and valuable works of art, delicate objects and antiques. Our museum standard humidity and temperature control, environment and closely managed handling procedures insure your effects are looked after in your absence. Nobody needs to have access to your things at any time during storage. The boxes are stacked up to four high and very close together, making it impossible for unauthorised people to open them Our warehouses are secure and alarmed, with our sites having closed circuit TV surveillance. Please label or identify all items for storage clearly. It is your job to make sure that nothing is left out or included inadvertently. Make sure that 'white goods' (freezers, fridges, washers, etc.) are turned off a few days early and thoroughly dried out - they will cause mildew if packed wet. Ensure that everything is clean and dry, particularly things normally used outside (bikes, garden tools, etc). Work out the value of the goods for insurance purposes (see details on Insurance below). Greens offers a range of different storage services for full house removal services down to smaller quantities and single items. If storage is required for a weekend, a week or a year, Greens has the perfect facility. We offer an individual storage service for those excess household items, this could be the solution to creating more space in your home! We can store items such as excess garden furniture, caravans, sports equipment etc. We can either collect from you with our removal service from Greens Removals or through our self storage service www.simplystore.co.uk. www.simplystore.co.uk is unique. We offer mobile self storage Ipswich and mobile self storage Stowmarket, where we bring the storage container to your door. We offer this service through our Greens Removals Stowmarket Branch covering the Mid Suffolk area. We also offer this through our Greens Removals Cambridge Branch for mobile self storage Cambridge and mobile self storage Newmarket covering the Cambridge area. Please go to our website www.simplystore.co.uk for full details on costs for storage and packing materials. You can also click here for a video demonstration http://www.youtube.com/watch?v=g72sGlj4jCs. Packing materials are delivered at no cost subject to a minimum order. We give you a service which is tailored to your needs giving you an individual service at competitive prices.